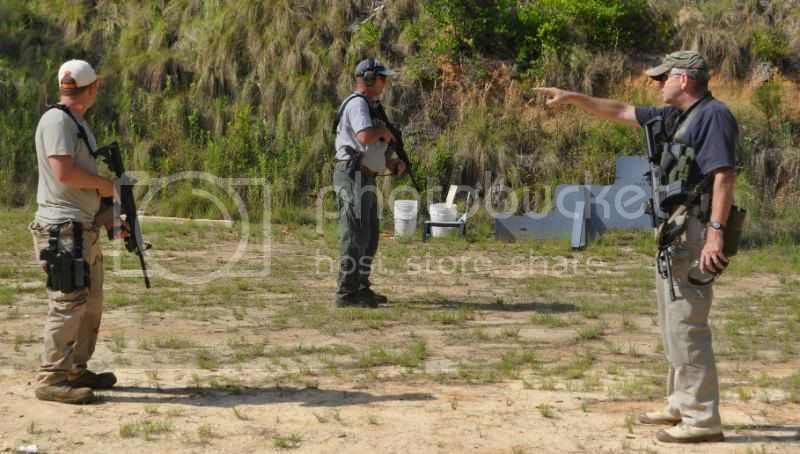 Steve Cooper with is one of the premiere firearms instructors in the south east. He teaches everything from CWP to advanced carbine tactics. The class that will be covered in this article is the 2 day BDC "Basic Defensive Carbine". 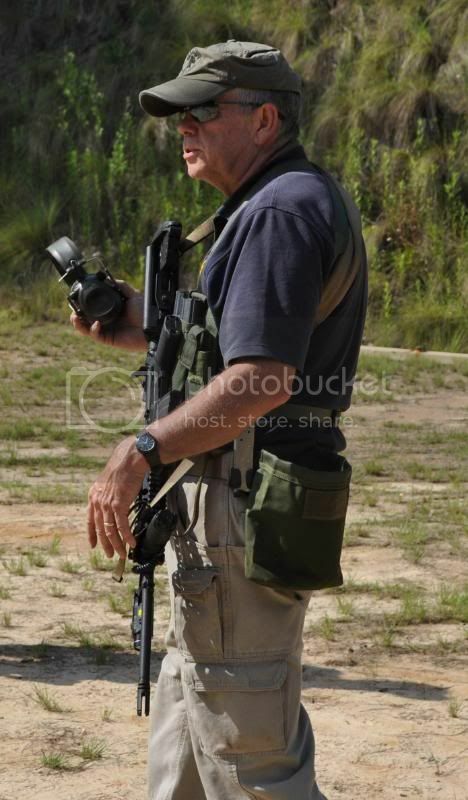 This will be the fifth carbine I have attended and I still gained knowledge from his course. Gear Used: BCM 16" carbine, Gear Sector sling and attachments, Aimpoint R-1 on Larue high mount, Elzetta light, 550 rounds of 855, pmags, Garrett Industries holster with Glock 17, US Palm Defender rig, Oakley gloves/eyepro, Peltor Comtac II, Eotac/5.11 pants, merrel boots,and 20 bottles of gatorade. The day started with a safety briefing and introductions where each student would state their purpose for wanting to take this class. Duty-zombie apocolypse were the most common answers as most carbine classes. Steve used this time to feel the students out and gain knowledge of everyones background which he would use later to conform his teaching to tailor each student. After the icebreaker it was time to hit the range. The range we used is located at Lake Darpo SC which is between Society Hill and Darlington if my bearings were correct. First off we got our zeros which took roughly 25-40 rounds. Constant Trigger Contact, Reset, and Prep for next shot drills pounded in the basic trigger press techniques from the prone position. We worked on getting off the "X" most commonly known at the Unified Point of Attack "UPA" which is basically your starting point when engaged in combat. Movement is the key to survival and the quicker you get off the X hopefully you can make your enemy miss whether it be with a firearm, knife or fist. Steve incorperated lateral movement and 180 degree turns while engaging a 3" circle with 3 shots from 7-10 yards. The temperature was in the 90s so we took much needed breaks to hydrate and Steve took time to ensure you were picking up what he was putting down. Once everyone was pretty comfortable with the drill tactical reloads with retention were added in. 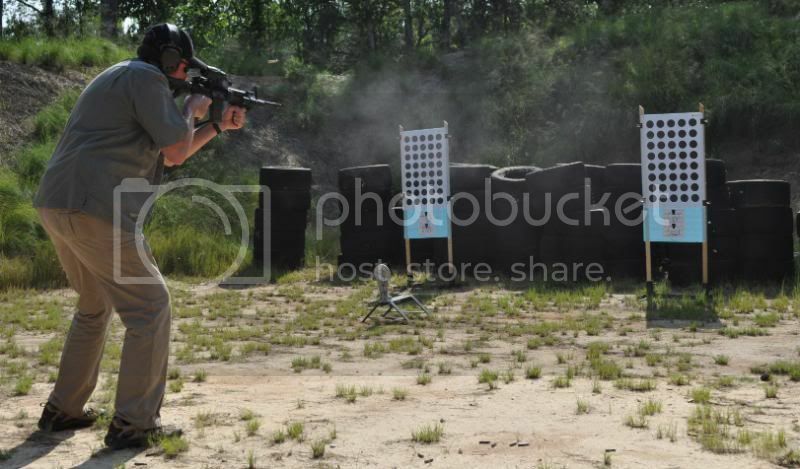 As the class progressed the concept of if you are not shooting you are moving unless behind cover. 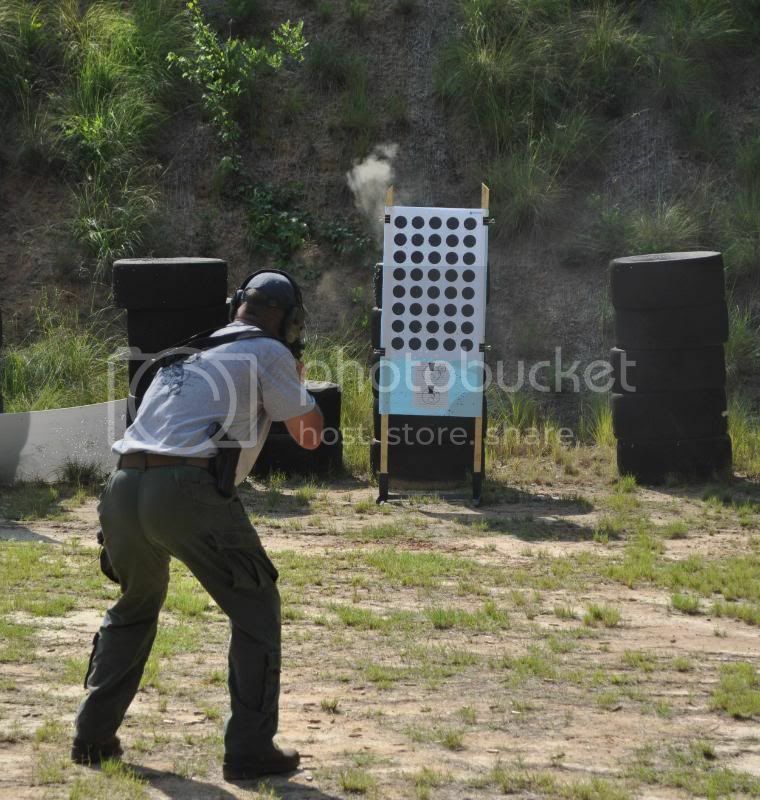 The rest of Day 1 consisted of fundamental drills consisting of trigger control and target recognition. With photo-realistic targets we had to identify threats and non-threats and take appropriate action against them. One COF consisted of a police officer and it drew quite a bit of debate. The question that was posed is that "what do you do if confronted by a law enforcement officer while carrying a battle rifle during times of natural disaster or worse case senario?" Im not sure we came to a clear solution even with a LEO in the class. Its definately something to consider how you would handle the situation with-out posing a threat to the LEO. Just before we ran out of daylight we had a little fun. Steve had us store our gear in our vehicles. He tested us on how long it would take us to gear up and run to the 50 yard line. Once there he would luminate the targets with a visible laser and we would engage them from our sectors of fire. All 6 students did a great job of identifying targets and communicating. Once darkness fell we did a night shoot with the use of flashlights to identify friendlys and bad guys. We then did a short lesson on CQB tactics indoors with TacLights. This concluded Day 1. Day 2 started out with reconfirming our zero, then briefly revisiting Day 1 lessons. We worked malfunction drills of all types. We did some position shooting and discussed some different techniques that are availible to use in unique situations. We shot from cover and discussed best ways to use it. Urban Prone...I know my legs are exposed.. This video is of a senario hostage situation similar to the end scene in the movie TAKEN. You ask the hostage taker a question, when he starts to respond you shoot him or her in the head. The thought process behind this is that if they are thinking of a answer or answering your question they cant be squeezing the trigger. The target I we were shooting at is the small target in the right hand top corner of the target. This is a 2" circle, so you will have to know the hold-over of your optic/weapon to make this shot or things could go downhill quickly. We ended Day 2 with a little competition shooting 5 standing 5 kneeling and 5 prone from 100 yards on the clock. Lessons learned made for a tight competition. 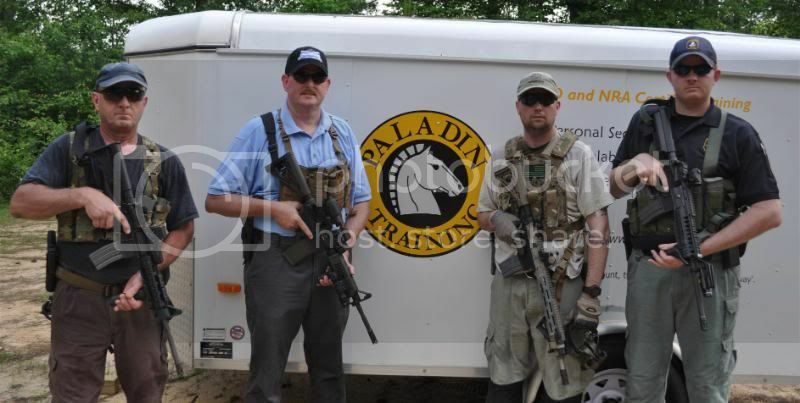 In conclusion, I would like to say that Steve Cooper and Paladin training are top knotch. Steve does a great job of picking out your weaknesses and helping you develop them. I would recommend this class for anyone wanting a start in defending themselves with a carbine and for those who have advanced skills looking to fine tune them. Steve brings years of experience to plate and I was honored to tap into his wealth of knowledge. I will definately be getting back to train with him whenever possible. I would like to thank Steve, Butch, Ryan, Bubba, James, and the "Doc" for a great time!